This article is about the country music genre. For Sirius XM radio channel, see Outlaw Country (Sirius XM). For the 1949 American Western film, see Outlaw Country (film). Outlaw country is a subgenre of American country music, most popular during the 1970s and early 1980s, sometimes referred to as the outlaw movement or simply outlaw music. The music has its roots in earlier subgenres like honky tonk and rockabilly and is characterized by a blend of rock and folk rhythms, country instrumentation and introspective lyrics. The movement began as a reaction to the slick production and popular structures of the Nashville sound developed by record producers like Chet Atkins. Early "outlaws" include Waylon Jennings, Willie Nelson, Kris Kristofferson, Johnny Cash, Merle Haggard, Guy Clark, Jerry Jeff Walker, Jessi Colter, Tompall Glaser, David Allan Coe, Sammi Smith, and Tanya Tucker. Other associated artists include Hank Williams Jr., Charlie Daniels, B.W. Stevenson, the Eli Radish Band, Leon Russell, Townes Van Zandt, Michael Martin Murphey, Billy Joe Shaver, Steve Earle, Joe Ely, Johnny Paycheck, Ed Bruce and Gary Stewart. The outlaw sound has its roots in Western swing bands of the 1930s and 1940s, honky tonk music of the 1940s and 1950s, rockabilly of the 1950s, and the evolving genre of rock and roll. Early outlaws were particularly influenced by predecessors like Bob Wills, Hank Williams, Elvis Presley, and Buddy Holly. However, an even greater transition occurred after Waylon Jennings and Willie Nelson were able to secure their own recording rights, and began the trend of bucking the "Nashville sound". According to Michael Streissguth, author of Outlaw: Waylon, Willie, Kris, and the Renegades of Nashville, Jennings and Nelson became outlaws when they "won the right" to record with the producers and studio musicians they preferred. The origin of the outlaw label is debated. According to Jason Mellard, author of Progressive Country: How the 1970s Transformed the Texan in Popular Culture, the term "seems to have sedimented over time rather than exploding in the national consciousness all at once". The term is often attributed to "Ladies Love Outlaws," a song by Lee Clayton and sung by Waylon Jennings on the 1972 album of the same name. Another plausible explanation is the use of the term a year later by publicist Hazel Smith of Glaser Studios to describe the music of Jennings and Tompall Glaser. Art critic Dave Hickey, who wrote a 1974 profile in Country Music magazine, also used the term to describe artists who opposed the commercial control of the Nashville recording industry. In 1976, the Outlaw movement solidified the term with the release of Wanted! The Outlaws, a compilation album featuring songs sung by Waylon Jennings, Willie Nelson, Jessi Colter, and Tompall Glaser. Wanted! The Outlaws became the first country album to be platinum-certified, reaching sales of one million. 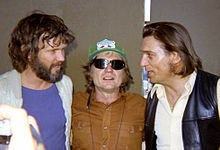 L-R Kris Kristofferson, Willie Nelson, Waylon Jennings at Willie's 1972 4th of July Picnic. As Southern rock flourished, veteran country artists incorporated rock into their music in this genre. Songwriters/guitarists such as Willie Nelson, Waylon Jennings, and Hank Williams, Jr. shed formulaic Nashville sound, grew long hair, and replaced rhinestone-studded suits with leather jackets. Fiercely independent, the "outlaws" abandoned lush orchestrations, stripped the music to its country core, and added a rock sensibility to the sound. Although Jennings and Nelson are regarded as the stereotypical outlaws, there were several other writers and performers who provided the material that infused the movement with the outlaw spirit. Some people have noted that Jennings and Nelson were Nashville veterans whose careers were revived by the movement and that they drew on the energy that was being generated in their home state of Texas to spearhead the attack on the Nashville producers. Jennings, in particular, forced his record company to let him produce his own albums. In 1973 he produced Lonesome, On'ry and Mean. The theme song was written by Steve Young, a songwriter and performer who never made it in the mainstream, but whose songs helped to create the outlaw style. The follow-up album for Jennings was Honky Tonk Heroes and the songwriting hero was Texan Billy Joe Shaver. Like Steve Young, Shaver never made it big, but his 1973 album Old Five and Dimers Like Me is considered a country classic in the outlaw genre. Willie Nelson's career as a songwriter in Nashville peaked in the late 1960s. As a songwriter, he had written a number of major pop-crossover hits, including "Crazy" for Patsy Cline and "Hello Walls" for Faron Young, but as a singer, he was getting nowhere. He left Nashville in 1971 to return to Texas. The musicians he met in Austin had been developing the folk and rock influenced country music that grew into the outlaw genre. Performing and associating with the likes of Jerry Jeff Walker, Michael Martin Murphey and Billy Joe Shaver helped shape his future career. At the same time as Nelson was reinventing himself, other significant influencers were writing and playing in Austin and Lubbock. Butch Hancock, Joe Ely and Jimmie Dale Gilmore formed The Flatlanders, a group that never sold huge numbers of albums, but continues to perform. The three founders have each made a significant contribution to the development of the outlaw genre. The Lost Gonzo Band and their work in conjunction with Jerry Jeff Walker and Michael Murphey were integral in the birth of Outlaw Country. Other Texans, like Townes Van Zandt, Steve Earle and Guy Clark, have developed the outlaw ethos through their songs and their lifestyles. Although Johnny Cash spent most of his time in Arkansas and Tennessee, he experienced a revival of his career with the outlaw movement, especially after his live albums At Folsom Prison and At San Quentin, both of which were recorded in prisons. Cash had working relationships with Nelson, Jennings and Kris Kristofferson in his later career, culminating in the formation of The Highwaymen; the four would record and perform as a supergroup in addition to their solo careers through the late 1990s. Cash had also been on good terms with several folk counterculture figures, a fact that irked Nashville and television executives (Cash hosted a variety show from 1969 to 1971). Like the other outlaw singers, he eschewed the polished Nashville look with a somewhat ragged (especially in later years), all-black outfit that inspired Cash's nickname, the "Man in Black". In 1976, the Outlaw Movement reached a new milestone with the release of Wanted! The Outlaws, a compilation album featuring songs sung by Waylon Jennings, Willie Nelson, Jessi Colter, and Tompall Glaser. Wanted! The Outlaws became the first country album to be platinum-certified, reaching sales of one million. The outlaw movement's heyday was in the mid- to late 1970s; although the core artists of the movement continued to record for many years afterward (Nelson, in particular, was recording hits well into the following decade while Hank Williams, Jr. achieved his greatest success during the 1980s), by 1980 mainstream country music was practically dominated by country pop artists. Some of the outlaws would have a slight career renaissance in the mid-1980s with the neotraditional country revival, which revived the older styles of both mainstream and "outlaw" country music of years past. Newer artists, such as Robert Earl Keen Jr., Ryan Bingham, Jamey Johnson, Cory Morrow, Roger Creager, Kevin Fowler, Shooter Jennings, Wade Bowen, Jimmy Aldridge, Jesse Brand and groups such as Randy Rogers Band, Cross Canadian Ragweed, Jason Boland & the Stragglers, and Eli Young Band, who grew up during the original outlaw movement, have recently been re-energizing the Outlaw Movement and keeping with the "outlaw spirit". Also, older artists such as Ray Wylie Hubbard, Billy Joe Shaver, and David Allan Coe have also been contributing to the resurgence of the outlaw sound. Because many of these artists are native Texans or call Texas their home, it is often referred to as Texas Country. Robert Earl Keen, Pat Green, and Cory Morrow are most notably credited[by whom?] with bringing Texas Country out of the honky tonks and onto college campuses. Keen, a graduate of Texas A&M University, where he and fellow songwriter Lyle Lovett were roommates, has been performing on college campuses since the late 80s. Along with Green's shows in the late 90s, these artists began to increase with incredible popularity on college campuses in Texas and Oklahoma including Texas Tech, (Green's alma mater), Texas A&M, Oklahoma State University (home of the red dirt music scene) and the University of Texas. Their popularity gave more exposure to other Texas Country artists like Cory Morrow, Roger Creager, and Kevin Fowler and to groups like Cooder Graw. 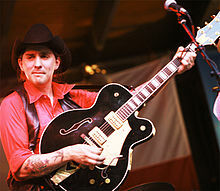 In 1998, maverick record executive Rick Smith, of Fort Worth, launched the "Live at Billy Bob's Texas" series of recordings, which have featured legends such as Willie Nelson, Billy Joe Shaver, Asleep at the Wheel, Merle Haggard, David Allan Coe and popular Texas Country artists like Pat Green, Jack Ingram, Cory Morrow, Cross Canadian Ragweed (Oklahoma), Jason Boland & the Stragglers, Cooder Graw, the Randy Rogers Band and Kevin Fowler. Other Texas based artists, such as Eleven Hundred Springs, Wayne "The Train" Hancock, Dale Watson, Stoney LaRue, Hayes Carll, and Mike and the Moonpies continue the tradition of their Outlaw Country forebears in Texas and have helped usher in the movement in honk tonks across the U.S.
^ a b Szatmary, David P. (2014). Rockin' in Time. New Jersey: Pearson. p. 213. ^ Inc, Nielsen Business Media (18 May 1996). "Billboard". Nielsen Business Media, Inc. Retrieved 23 December 2017 – via Google Books. ^ a b c "Outlaw music". Encyclopædia Britannica. Retrieved 2016-04-09. ^ a b c d Streissguth, Michael (2014). Outlaw: Waylon, Willie, Kris, and the Renegades of Nashville. itbooks. ISBN 0062038192. ^ "Nashville Recording Industry | Entries | Tennessee Encyclopedia". Tennesseeencyclopedia.net. Retrieved 2016-05-04. ^ Smith, William Michael (2013-08-14). "Remembering Tompall Glaser: An Outlaw Just Beyond the Spotlight". Houston Press. Retrieved 2016-05-09. ^ "Outlaw Country Music Genre Overview". AllMusic. Retrieved 23 December 2017. ^ "Waylon Jennings Dead at Sixty-four". Rolling Stone. Retrieved 2016-04-10. ^ a b Mellard, Jason (2013). Progressive Country: How the 1970s Transformed the Texan in Popular Culture. University of Texas Press. pp. 117–124. ISBN 0292753004. ^ Wolff, Kurt (2000). The Rough Guide to Country Music. Rough Guides. pp. 338–340. ISBN 1858285348. ^ a b "Flashback: Waylon Jennings and Willie Nelson Make Music History". Rolling Stone. Retrieved 2016-04-09. ^ Reid, Jan (2004). The Improbable Rise of Redneck Rock (New ed.). University of Texas Press. ISBN 0-292-70197-7. ^ "Album Review – Mike and the Moonpies' "Mockingbird"". Saving Country Music. Retrieved 2017-06-29. Reid, Jan (2004). The Improbable Rise of Redneck Rock (New ed.). University of Texas Press. ISBN 0-292-70197-7. Spong, John (April 2012). "That '70s Show". Texas Monthly. Austin, Texas. Retrieved October 26, 2013. Wolff, Kurt (2000). Country Music. The Rough Guide. Rough Guides. ISBN 1-85828-534-8. This page was last edited on 1 April 2019, at 16:11 (UTC).